Stormy 5-8′ Sunset Favors Local Knowledge at Vans World Cup Day One. SUNSET BEACH, Oahu/Hawaii (Tuesday, November 25, 2014): The Vans World Cup of Surfing – stage two of the Vans Triple Crown series – commenced at Sunset Beach today in stormy 10- to 15-foot crest to trough surf. Following 24 hours of strong, onshore winds, the unpredictability of the waves was visibly reflected in scores that ran the gamut. It was no surprise that today’s surf favored those with intimate knowledge of this vast and varied lineup, and surfers from Hawaii dominated the top wave and heat scores, led by Maui’s Kai Barger. 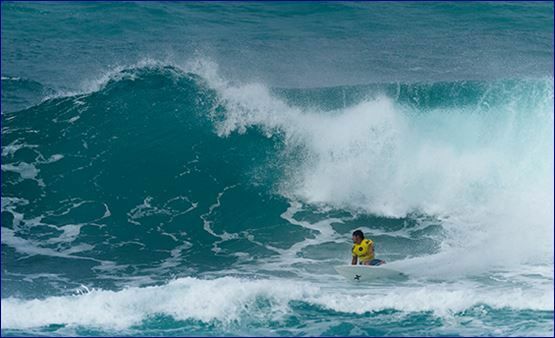 Unexpected eliminations today included that of Frederico Morais (PRT), who reached the Semifinals at Haleiwa; 6-time Vans Triple Crown champion Sunny Garcia (HAW); Conner Coffin (USA); and Krystian Kymerson (BRA). Maui’s Dusty Payne, winner of the first event of the Vans Triple Crown, has a one round head start this week and will make his debut as leader of the series when competition resumes. The No. 1 seed for this event is Australian Joel Parkinson, who makes his 2014 Hawaiian winter debut in this event in Round 3. A three-time champion of the Vans World Cup, Parkinson will hit the water on day three, matched up against Raoni Monteiro (BRA) and two surfers from the early rounds. Organizers will assess the conditions at first light tomorrow and a continuation of competition is possible. The Vans World Cup is a 4-day competition that will utilize the biggest and best surf between now and December 6. Fans from all over the world can experience the exciting competition via LIVE webcast at aspworldtour.com and vanstriplecrownofsurfing.com. The event will also be televised LIVE on Oceanic Surf Channel 250 & 1250HD across the state of Hawaii. Images from the event will be available from Getty Images. In addition a small number of hand-out images, as well as daily news feeds, will be made available for editorial use via our email distribution lists. Please contact kscholtz@aspworldtour.com (images) and srobertson@aspworldtour.com (news feeds) to be added to the lists.